Cotton is a natural fibre that is harvested from the cotton plant. The fibre is soft and it grows around the seeds of the cotton plant. The silky fine fibres are spun into a thread, which can then be woven or knitted to make a soft, breathable textile. There is more cotton grown globally than any other non-edible crop. Since 1940, world cotton consumption has increased at an average annual growth rate of approximately 2%. Cotton fibre can be woven or knitted into fabrics such as velvet, corduroy, chambray, velour, jersey and flannel. Linters are the very short fibres that remain on the cottonseed after ginning. Once removed and processed, linters are used to produce goods such as bandages, cotton buds, and x-rays. Cottonseed oil can used for cooking or used in a range of industrial products such as soap, margarine, emulsifiers, cosmetics, pharmaceuticals, rubber and plastics. Cottonseed oil is cholesterol-free, high in poly-unsaturated fats and contains high levels of antioxidants (Vitamin E) that contribute to its long shelf life. The stalk of the cotton plant is processed for the development of ethanol in petrol or diesel blends and also used as mulch to improve soil organic matter. The fibre from one 227kg cotton bale can produce 215 pairs of jeans, 250 single bed sheets, 750 shirts, 1,200 t-shirts, 2,100 pairs of boxer shorts, 3,000 nappies, 4,300 pairs of socks or 680,000 cotton balls. 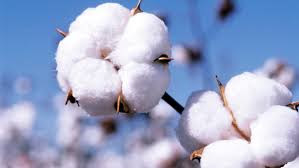 Cotton is hypoallergenic since it doesn’t irritate sensitive skin or cause allergies. Cotton is one of the easiest fabrics to dye, making it very popular with fashion and home ware designers. Cotton keeps the body cool in summer and warm in winter because it is a good conductor of heat. Cotton fibre possesses many unique properties such as strength, durability and absorbency. Cotton grows best on fertile, well drained soils that have a good water holding capacity, although it can grow on a variety of soils. In California, cotton is found in the San Joaquin, the Imperial, Palo Verde and Sacramento Valleys. With their warm springs, hot summers, and dry falls, these regions give cotton the long growing season it needs. In fact cotton is the most popular fabric and best selling fabric in the world. It is used across the fashion industry to make designer clothing as well as more main stream clothing for both adults and children.